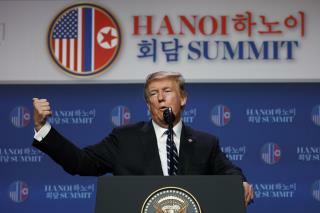 (Newser) – "Sometimes you have to walk, and this was just one of those times," President Trump said Thursday after his second summit with Kim Jong Un abruptly collapsed. A working lunch and the signing of a joint agreement were scrapped after talks fell apart on the summit's second day, causing confusion among the press corps, the New York Times reports. "It was about the sanctions basically," Trump said at a press conference. "They wanted the sanctions lifted in their entirety and we couldn’t do that." Trump said Kim had been willing to dismantle some of the country's nuclear infrastructure in return for sanctions being lifted, but wanted to leave other parts of the program intact, the Guardian reports. How can he declare a National emergency and then leave the Country. What kind of president does that? It's not necessarily trump that breeds hatred,a lot of people,like me, dislike liars and con men whatever their name or political affiliation is.